Apple admitting flawed antenna design by giving out free bumpers? Were I allowed one more follow-up, I would have pointed out that Apple’s proposed solution, its bumper case, provides just a thin layer of rubber and plastic between the antenna and the user’s hand. If that actually mitigates the problem, as Apple claims, then it’s clear that even a thin layer between the user’s hand and the antenna can make a big difference. Apple claims the external antenna is their best design yet. Hinting that skin contact doesn’t matter as all phones suffer from attenuation (and here are a bunch of videos to back that up). If this is the case, then as John Siracusa points out, doesn’t it seem a bit odd for them to give out bumpers? Especially when all the bumpers do is bring the iPhone 4 in line with the signal attenuation of other phones. After reading this new web page about antenna design on Apple’s website my iPhone suddenly stopped losing signal! Obviously I’m joking, but like I said in my previous post, this how Apple is really trying the solve the problem. Ignore the facts that show iPhone 4 suffers worse attenuation than any other cell phone and try to blend in with the normal attenuation crowd. Too bad most of the people I talk to about this issue are good at “Where’s Waldo Apple?”. My big problem with their explanation is that it misses the fact that the iPhone 4 suffers worse attenuation, with less touching, than any other phone out there. They back up their claim with a bunch of videos of other phones dropping bars in the death grip, just like the iPhone. I back up my claim by looking at the chart from AnandTech above. You can see the iPhone 4 when held naturally (not death grip) drops almost twice as much actual signal strength compared to the Nexus One. Until Apple releases a video of another phone siting on a desk, being touched with one finger, and severely degrading signal, their statement will stand in my eyes as an excuse, rather than fact. Q: Your demo shows a vise grip on the phone to make the bars drop, but online we’ve seen that you can touch with a single finger. A: Your body is a pretty effective signal absorber on any phone when you make contact with that phone, its performance is less than its free space performance. With the amount of money on the line, I guess Apple can’t really admit their antenna design causes worse attenuation than the rest of the industry. There only option here was to ignore this fact and try to blend in with the rest of the attenuation crowd. With that said, I’m glad they are giving away free bumpers and third party cases…it’s a quick, cheap, solution to the problem. I’ll guarantee you this…similar looking design or not, the iPhone 5 will not have the same issue. While the software update obviously does not and cannot address the design of the antenna itself – or make the drop from holding the phone any less – it does change the way the issue is perceived among users. The result is that most iPhone users will see fewer bars disappear when they hold the iPhone 4 in a bare hand. 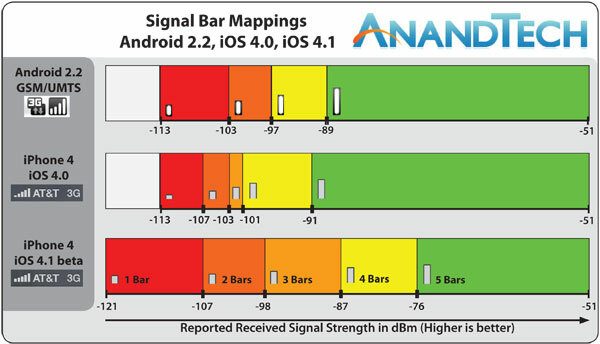 The side effect is that the iPhone now displays fewer bars in most places, and users that haven’t been reporting signal in dBm will time see the – perhaps a bit shocking – reality of locations previously denoted as having excellent signal. Interestingly enough, Apple has indeed changed the heights of bars 1, 2, and 3. They’re taller, and the result is that the relative heights are no longer linear, but rather a tad exponential looking. It’s a mind trick that Apple no doubt hopes will make the signal look better. If the bars are taller, they must denote stronger signal, right? Even with Apple’s “magicalness”, they still can’t fix hardware issues with software alone. Finally got iOS 4.1 installed and I’m “stunned” to see this update didn’t magically fix a hardware issue. The only difference now is instead of dropping from 5 bars to 1, I start at 3. Here are the results from my quick speed test. Apple to hold iPhone 4 press conference Friday? Apple on Wednesday invited select press to a special press conference to be held this Friday in California. I guess they realized their PR statement last week wasn’t good enough. We shall see if they are taking this time to announce a recall or continue denying the issue.